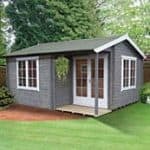 For a real showpiece in your outdoor space and somewhere to entertain or relax then be the envy of all your friends with the Kinver Log Cabin. 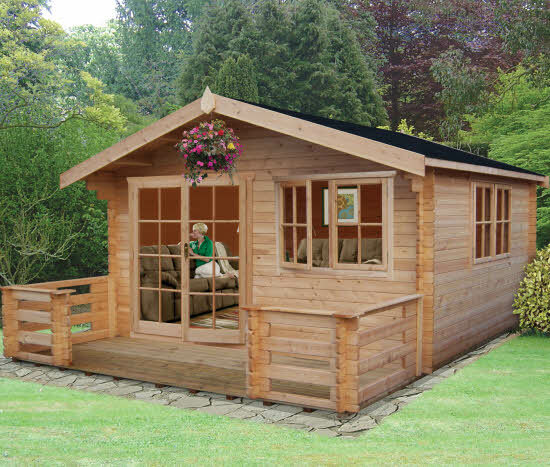 This is a stunning log cabin which comes complete with its own terrace and fence at the front. 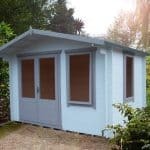 One large single door with glass panes and functional windows plus a generous apex roof makes this a beautiful feature for any garden. Enjoy hours of solitude inside with your favourite books and a glass of wine or have a snooze on the terrace in the sunshine. Whatever you choose you will have years of enjoyment in this superb building. 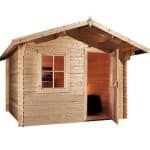 The strong and sturdy wood has a planed smooth finish and the door locks for security. 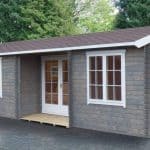 This building is home delivered and assembled for your conveneince. I recently joined a hunting club and needed something comfortable enough for a few nights a week. I researched a few little cabins, but they didn’t meet my expectations. 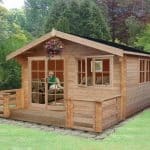 I found the Shire Kivner Wooden Log Cabin while browsing and found it was what I was looking for. It has a terrace, so I can enjoy a glass of wine under the night sky after a long day in the woods. I like that it has a lock with key, so it will be safe when I’m not around. I kept it a natural wood color to blend in with it’s wooded surroundings. Several people in the hunting club has complimented it, so I recommended the site to them. Thanks for the good customer service.